In Aintree history, there have been only three Grand National Grey Horses to win the great race. Yet, every year in the build-up to the Grand National the myth about grey horses comes back. Whether there is a reason behind it or not, the fact remains. Since the first running of the Grand National in 1839 these THREE GREY WINNERS, have won the race four times! If you’re familiar with the Grand National, you’ll know there is an element of truth in the Grand National ‘Grey Theory’. It’s certainly not been ‘Fifty Shades Of Grey’. But more like ‘Three Shades Of Grey’ when it comes to Grand National Grey horses winning the world’s greatest steeplechase. We don’t know how many have tried – it’s a virtually impossible task to check that. Though, grey horses are certainly a minority when it comes to racehorses in general. With their standout looks, punters love to latch onto a grey. Desert Orchid being the most famous recent example of this. Dessie is arguably the most famous grey racehorse in the last 30 years. But despite winning over fences at Aintree he never ran in the Grand National. Many will say that the reason not that many Grand National grey horses have won will link back to breeding. But really this is just a theory. It’s probably more the fact that not as many grey horses have actually run in the race than we think. While, not only have they got to get into the race, they’ve also got to have a leading chance. Then, with all the tests a Grand National throws at any horse, they have to navigate 30 fences, fallers and staying the 4m+ trip! 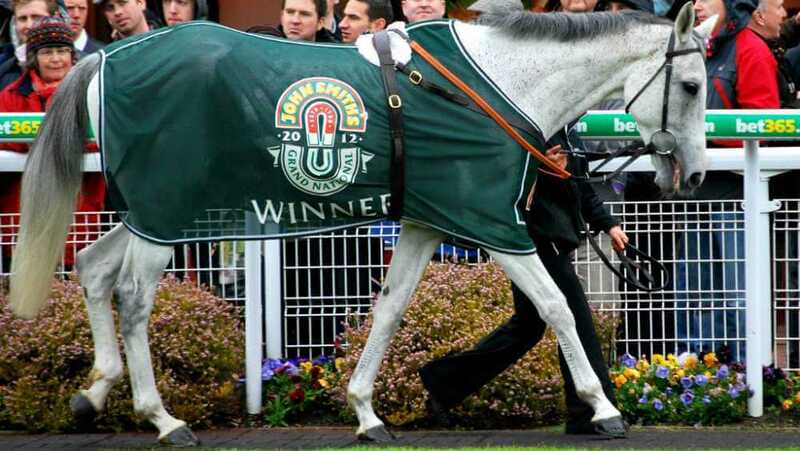 It’s funny really, as the three Grand National grey winners we’ve seen in the race – Neptune Collonges (2012), The Lamb (1868 & 1871) and Nicolaus Silver (1961) – have become more famous for the colour of their skin that actually winning the race. Grand National grey horses that placed are also remembered a lot more than other horses to place. Suny Bay, who was second in 1997 and 1998, is a classic example of this. While, more recently What’s Up Boys, who chased home Bindaree in 2002, is another memorable Grand National Grey horse. Who Are The Grand National Grey Winners? The first Grand National grey horse to win and actually he also took home the second too. He took the race in 1868 and 1871, with a name reflecting his smaller frame and pleasant manners. The Lamb took his first National at the age of 6 years-old. This is unheard of in the modern era. He might have won the race more but during 1869 and 1870 he was sidelined due to a wasting disease. He came back to win the 1871 race – still only 9 years old. There was a further sub-plot behind The Lamb’s Grand National wins. There were reports that he actually shed his grey coat to one that was black! Therefore, many still question his second National win as being won by a ‘Grey Horse’. There are paintings of the horse around his second National win as being a black horse. This suggests that even though he was grey when he won in 1868, he might not have been in 1871! Trained by Fred Rimell and this horse was the second of four Grand National successes for that handler. The horse cost 2,500 guineas from Ireland. Many people thought he was overpriced at the time – but not Rimmel. He’d noticed that the horse would be better on decent ground – something he was unlikely to get in Ireland – and this was proved right when winning the 1961 race under jockey Charles Vaughan at 28/1. The strange fact about this horse is that Nicolaus Silver’s owner later married a granddaughter of The Lamb’s owner – it must have been a ‘Grey Wedding’! This Paul Nicholls-trained 11-year-old broke a 50-year Grand National grey hoodoo to land the 2012 renewal – but it was close. Under Daryl Jacob this Grand National grey horse only had a nose to spare at the line from Sunnyhillboy, but they all count. When looking back at the record books, not many people care too much about the winning distances. This 11-year-old also defied a few more trends as he won with 11-6 on his back and with that became the first horse since the mighty Red Rum (1977) to win the Grand National with 11-6 or more. He certainly added a bit of class to the race as this popular grey had been placed in the Cheltenham Gold Cup before. The £547k he picked up for winning the race was a massive £342 more than the second that day picked up – a lot of money for the sake of a nose difference! But that big pot helped see this Nicholls horse take his career earnings to £1.3million and if we talk about going out at the top, then this horse did just that – he never raced again. His win also added another bit of spice to the end of the 2011/12 champion trainers’ battle as Nicky Henderson had things more than sewn-up that season. However, Nicholls, who was yet to win the Grand National, had one more ace to play and that was Neptune Collonges. With his £540k first prize that was enough to overtake Henderson in a dramatic end to the trainers’ title race – a double celebration all around. Did you know? – Neptune Collonges was owned by John Hales, who was famed for making the Teletubby toys. Grand National Grey Horses Betting on Grand National Grey Horses Who Are The Grand National Grey Winners?